SCOTTSDALE, Ariz., Feb. 05, 2016 – The sale of the first all-new Ford Focus RS performance car fetched $550,000 for charity at the Barrett-Jackson Scottsdale auction at WestWorld. The one-of-a-kind Magnetic Gray Focus RS was auctioned by Ford Motor Company at no reserve, with proceeds benefiting JDRF, the leading global organization funding type 1 diabetes research. 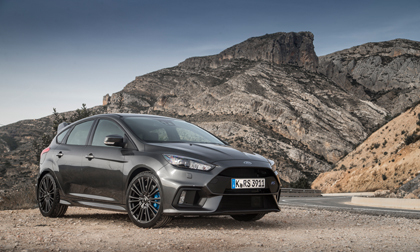 The new Focus RS goes on sale in North America this spring. The winner of Barrett-Jackson lot No. 3009 now has the only Focus RS in North America wearing Ford’s unique magnetic paint color. Designed and engineered to deliver owners a highly track-capable hot hatch, Ford Focus RS is packed with cutting-edge technology including all-new Ford Performance torque-vectoring all-wheel drive. Focus RS is powered by a 2.3-liter EcoBoost® engine that sends 350 horsepower and 350 lb.-ft. of torque to all four wheels simultaneously. Other features include 19-inch premium painted alloy wheels wrapped in Michelin Super Sport tires, unique RS front fascia and grille, distinctive headlamps and fog lamps, redesigned rear wing for added downforce, and RS sport exhaust with dual bright tips. Complete vehicle specs and images of the car can be found here. Together, Ford Motor Company and Barrett-Jackson have raised more than $8 million at various auctions benefiting local and national charities over the years. JDRF is the leading global organization focused on type 1 diabetes (T1D) research. JDRF’s goal is to progressively remove the impact of T1D from people’s lives until we achieve a world without T1D. JDRF collaborates with a wide spectrum of partners and is the only organization with the scientific resources, regulatory influence and a working plan to bring life-changing therapies from the lab to the community. As the largest charitable supporter of T1D research, JDRF is currently sponsoring $568 million in charitable research in 17 countries. For more information, please visit http://www.jdrf.org/.